I’ve always been a polite person who insists upon manners from my children and students in my classroom. That said, I’m sick and tired of constantly apologizing. I’m sick and tired of saying “I’m sorry” because my rolling walker is blocking your way in that super narrow aisle. I’m sick and tired of saying “I’m sorry” that you bumped into me because you weren’t looking in the first place because, as a healthy person, you have the privilege of not having to think about how much space you are taking up. As a healthy person, you have the privilege of not worrying that your speed (or lack thereof) is holding up the elevator, or line, or aisle. Yet, as the person with the cane, or wheelchair, or walker, I find myself making the apology for once again gumming up the works. I smile, make eye contact, make a self-deprecating joke about my speed, or “wheels” (if it’s my rollator) to make you more comfortable – because you can’t figure why an otherwise healthy looking young mother needs such accessories in the first place. You look at me and my family. Some will think to hold the door, others walk right through, yet, I’m the one saying “I’m sorry.” Sorry I’m taking too long, or bumped into you because of my balance issues. Some will suddenly go out of their way to be helpful, seeing me as some damsel in need of saving, especially if I’m not with my husband but alone with one of my children. So I say, “I’m sorry. No, I really don’t need help, I’m fine, thanks.” I don’t require any extra special treatment, just give me space and don’t knock me over, please. 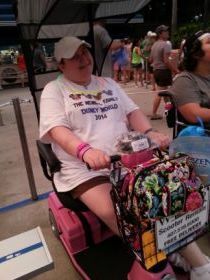 When we go to huge places like amusement parks and my lupus and/or fibromyalgia is really flaring, I will rent an electric scooter. This allows me to keep up with my family and stay healthy. When my children were 7 and 10 we went on a big family trip to Disney World and I rented a bright pink scooter complete with canopy to protect my photosensitive skin from the sun. I spent eight months planning for this trip making sure every detail was “perfect,” but after a few years of dealing with the hell that lupus had dealt us, we needed some fabulous family together time. Now, I’ll be the first to admit that navigating this pink canopied wagon around was not easy and I was not a graceful driver (to put it mildly). There’s a lot of footage of “,ommy bumping into things,” “mommy stuck in the corner, again” and the ever favorite, “daddy needs to back mommy’s scooter out, again.” But this pink scooter made it possible for me to have that dream family vacation with my husband and children without using every single “spoon” just to get from the hotel room to the bus stop for the parks. That said, I’ve never said the words “I’m sorry” so many times in so few days. “I’m sorry” that your child ran in front of me causing me to stop, short hurting myself in the process, because you were so busy taking a “selfie” that you didn’t notice. “I’m sorry” that loading my scooter on to the bus will take an extra three minutes and, yes, I hear your exasperated sighs and see your eye rolls. I want to get my exhausted children back to the room, too. “I’m sorry” that they had to move that rope line to allow my scooter through that incredibly serpentine section because these “wheels” aren’t able to navigate the tight curves. “I’m sorry” that my scooter is taking up that space where you wanted to sit to watch the parade, and no, “I’m sorry” I really can’t just move it since I got here an hour ago to make sure my little girl got a great view. No, I can’t sit in direct sunlight because, oh yeah, I really don’t feel like setting off a severe lupus flare by exposing myself to high noon August Florida sunshine because my disability is an inconvenience to you. I see you looking at me on my scooter, with my “invisible illness,” judging my extra weight (body by Prednisone) and have seen the mean viral videos about, “They should just walk around – then they’d lose the weight.” So when you stare or these “incidents” happen, I apologize. I wish I could say I’m strong enough not to let what you think bother me. I tell my students I don’t. I tell my children I don’t. But that’s a lie. I’m working on that. But that’s another piece. So, from this point on, I’m making an effort to stop apologizing for things that aren’t my fault, starting with my illness. I didn’t cause it, didn’t cause the problems that have arisen from it and I need to start making some serious amends – starting with myself. Because I’m worth it.